In honor of our Veterans, I'm dragging out my second World-War II inspired recipe. Tomato Gravy originated in the Southern United States and apparently was a favorite with Army cooks who often served it to troops when ingredients for "typical" gravy were scarce. Tomato Gravy is milder and creamier than a garlic and herb-flavored Italian-type tomato sauce, and not like brown gravy either. It's GOOD STUFF - if you've never had tomato gravy, it's just one more thing I highly recommend that you try. I used to LOVE having this over at a friend's house, in high school. His Mom served it over toasty, buttered white bread (which I wasn't allowed at home - possibly why I loved this gravy so much!). She's the one who told me how her father had worked in an Army mess hall and fondly remembered this gravy being served on many occasions. I didn't know people called it "Tomato Gravy" though, and spent years looking for a recipe for that "yummy tomato-sauce stuff". Thank goodness for the Internet, as I just re-discovered it a few years ago and have been inventing new uses (besides toasted Wonderbread) ever since! It's also good on greens, potatoes, pasta, gnocchi, "meat"loaf or (like any gravy) pretty much anything. Get out your cast iron skillet again. Heat the margarine or oil over medium heat. Stir in the flour with a whisk until it is lump free. Let simmer for a moment or two, to toast the flour just a little bit, and then remove from heat, and stir in the half cup milk, a little at a time. Put back on the burner, stir and bring to a boil, it will thicken considerably, and very fast. You’ll be left with a very thick mixture. Remove from heat, add the sugar and seasonings, whisking continuously, then slowly add the juice from the tomatoes. Put back on heat and simmer (very gentle boil). In a shallow bowl, smash the tomatoes with your fork or a potato masher to make them sort of choppy or shredded. This gravy is not smooth, so you don't have to work real hard at smashing them. The lumpy tomatoes are actually what give it the characteristic texture. Once gravy has come to a good simmer, add the tomatoes. Bring back to a medium simmer (but don't let it boil hard) and stir with whisk for 3 to 5 minutes until gravy thickens. **(optional: A couple shakes "Bacon Salt" or a drop or two of liquid smoke are really good here too, depending on if you want the "smoky" flavor; Southern Tomato Gravy is often, but not always, made with bacon drippings - blergh). Serve over toast, biscuits, whatever. i've never heard of tomato gravy before now - it sounds woooooonderful - something i'd very much enjoy! i like your idea to add a little liquid smoke to it. i can't wait to give this a whirl - i just need to think of something fun to smother in tomato gravy! yay! This is new to me but it sounds really good! I will try it sometime. And by the way, I like your theme! It's really versatile and goes well with so many things. It does tend to pair well with more "Italian-type" foods like gnocchi, polenta or eggplant. Oh my! This sounds wonderful! I've lived down here all my life but I've never heard of Tomato Gravy. I must get on this asap. I bet it'd be heavenly over some buttermilk biscuits...and I puffy heart Bacon Salt! Bianca, I never saw it when I was there either, but have since had several people ask me about it. 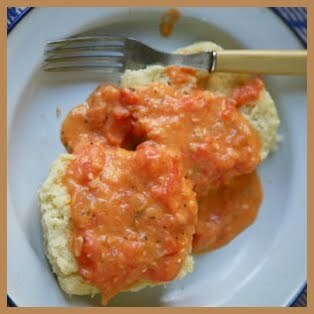 Just randomly ran across another (NON-vegan) blogger's Tomato Gravy recipe - with cheese biscuits. This would be so easy to make vegan and sounds SO GOOD!! Fried grits and tomato gravy tonight! Just struck how 'almost Italian' that is. Sort of polenta with creamy tomato sauce. Backwoods style, though. This was awesome last night over a leftover baked potato that was covered with leftover veggies. I actually love leftovers, but this elevated my "cleanin' out the 'fridge" dinner to a nice little gourmet feast.